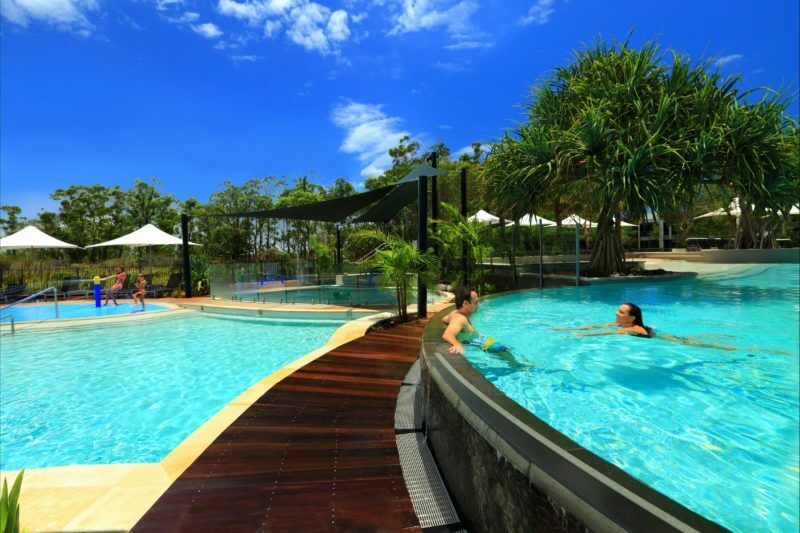 Surrounded by pristine beaches, rivers, hinterland and national parks, 5-star RACV Noosa Resort is perfect for families, couples or friends happy to share, featuring some of the largest and most modern suites and apartments in the region. 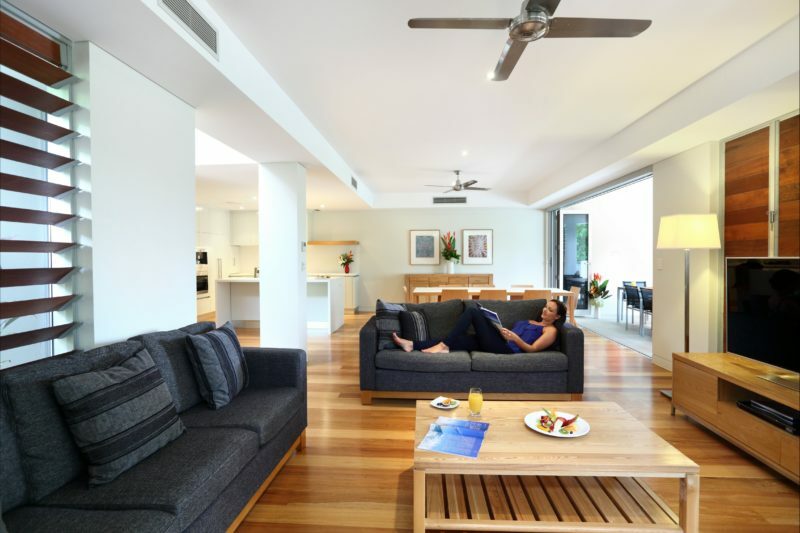 All apartments and villas feature a lounge area, kitchen with luxury alliances and stone bench tops, laundry facilities, Foxtel TV, DVD player, Nespresso machine and large private bathrooms. All have a balcony or terrace with outdoor seating. Some villas offer a private plunge pool or rooftop spa and exclusive, secure, undercover car parks. One-bedroom Suites are spacious and include a separate living area. 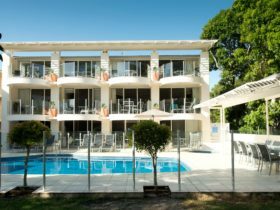 Relax by the 29° heated lagoon pool and outdoor heated spa, play in the water splash park pool, indulge at the day spa, or enjoy the many other facilities including the restaurant, sunset bar with wood-fired pizza oven, Gym, bike hire and flood-lit tennis court. 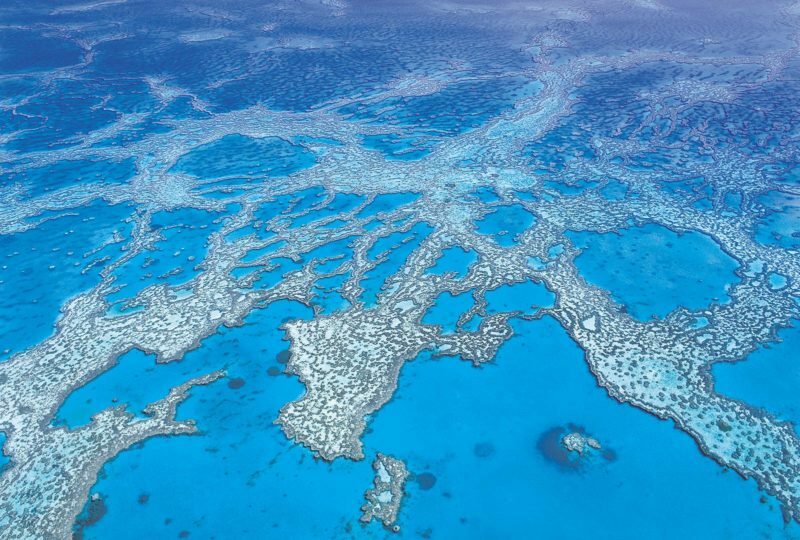 A free shuttle operates hourly every day to Hastings Street, Main beach and Noosa shopping precinct just minutes away. Visit now and see why RACV Noosa Resort was recently voted the best accommodation in Queensland at the prestigious Qld Tourism Awards and named as one of the Top 25 Hotels in Australia by Trip Advisor. 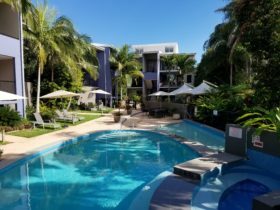 Relax in the modern surrounds of their self-contained One Bedroom Resort Apartments (57 square metres), which boast a master bedroom with television (Foxtel) and ensuite, king or twin beds and internal views over the resort. Stylishly appointed with contemporary furnishings and neutral tones that reflect the coastal environment each apartment also features an ensuite shower bathroom, separate living area with television, microwave, kitchenette, Nespresso coffee machine, mini fridge and washer/dryer combo. This room type is available on the ground floor with a terrace area, or first floor with a balcony adjoined to the living area perfect for soaking up the balmy Noosa weather. If you have a preference please note at time of reservation in “special requests”. Breakfast is not included but can be purchased separately. Room is serviced daily. Maximum occupancy is two adults (cot allowed). “The Enclave” – an exclusive three bedroom luxury villa, located in a private gated precinct, within the RACV Noosa Resort. Each exquisite three bedroom residence, built over three or four levels, features a huge open plan living, ducted air conditioning, timber floors, a second lounge room, five televisiions (Foxtel) and a rooftop terrace. Private lifts, heated plunge pools, two or three car garages are just a few of the little extras which elevate these Villas to exciting, new levels of luxury. 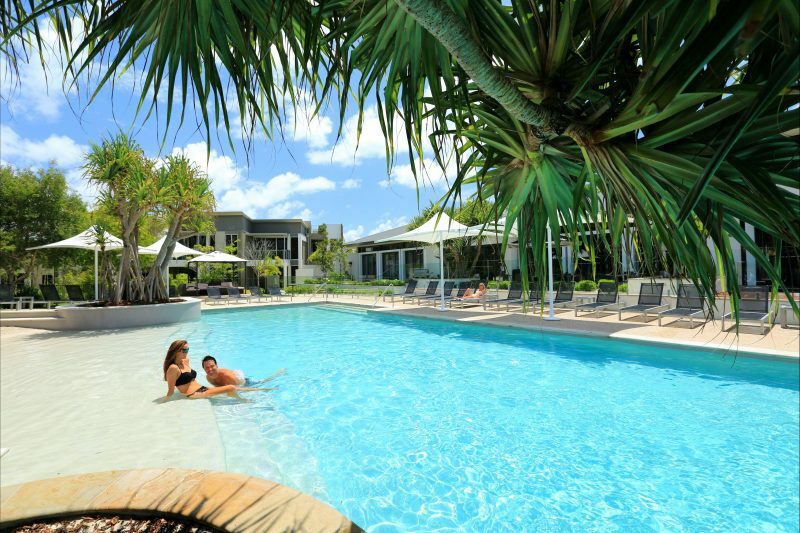 Residents of “The Enclave” have exclusive access to a 15 metre heated lap pool with communal barbecue area, as well as full access to all other facilities of the RACV Noosa Resort. Enclave Luxury Villas are extremely spacious and range in size from 437 square metres to 512 square metres (which includes balconies and rooftop terrace). The Enclave Luxury Villas are service daily. Room Only (Breakfast not included). Relax in the contemporary surrounds of a fully self-contained two bedroom Sanctuary Apartment positioned neighbouring the conservation sanctuary. The spacious two bedroom two bathroom Sanctuary Apartments (121 square metres) are furnished in smart coastal décor and feature a master bedroom with king or twin beds, full-length mirror and ensuite shower bathroom while the additional bedroom features a king or twin beds and separate main bathroom with shower/bathtub. The separate open plan fully equipped kitchen including a Nespresso coffee machine, living and dining areas, three televisions (Foxtel) and laundry facilities are brilliantly appointed with an adjoining private terrace or balcony with outdoor dining setting – perfect to kick back, unwind and enjoy the balmy Noosa weather. Apartments are serviced weekly. Existing bedding sleeps four (maximum occupancy five, additional charges apply) Room Only (Breakfast not included). Extremely spacious (200 square metres) three bedroom, three bathroom fully self-contained apartments, ideal for families or groups of friends. 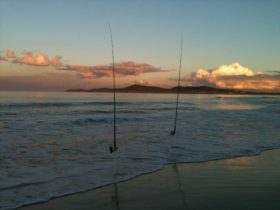 Each apartment is decked out in smart coastal décor and features three-bedrooms, with either king or twin beds, three bathrooms (two are ensuites), and open-plan living with fully equipped kitchen including a Nespresso coffee machine, dining, lounge, laundry facilities, four televisions (Foxtel) and a separate living area/media room. The main lounge has a widescreen television, while a separate media room has a television and DVD player. These wonderfully spacious apartments also boast two private terraces or balconies – the perfect place to entertain and socialise with friends and family or escape for some time. Apartments are serviced weekly. Existing bedding sleeps six (maximum occupancy seven, additional charges apply). Room Only (Breakfast not included). Two storey, fully self-contained three bedroom Villa (186 square metres) with private courtyard Plunge Pool. The entry level features a fully equipped kitchen including a Nespresso coffee machine, lounge, dining area, separate living/media room and the second floor has three bedrooms and two bathrooms. The master bedroom has a spa bath in the ensuite. Each Villa has a double undercover lock-up garage, three televisions (Foxtel), laundry facilities as well as a private courtyard plunge pool (not heated). There are also a limited number that have an internal lift (please request at time of reservation). There are balconies on two levels as well as a rooftop terrace. Villas are serviced weekly. Existing bedding sleeps 6 (maximum occupancy six). Room Only (Breakfast not included). 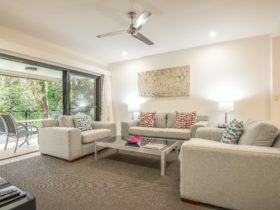 Relax in the modern surrounds of their self-contained One Bedroom Sanctuary Apartments (57 square metres), which boast a master bedroom with television (Foxtel) and ensuite, king or twin beds and positioned neighbouring the conservation sanctuary. Stylishly appointed with contemporary furnishings and neutral tones that reflect the coastal environment each apartment also features an ensuite shower bathroom, separate living area with television, microwave, kitchenette, Nespresso coffee machine, mini fridge and washer/dryer combo. If you have a preference please note at time of reservation in “special requests”. Buffet Breakfast is included for two adults. Room is serviced daily. Maximum occupancy is two adults (cot allowed). The fully self-contained two Bedroom Resort Apartments have internal views of the resort and feature two bedrooms, two spacious bathrooms (ensuite to master), fully equipped kitchen including a Nespresso coffee machine, dining and lounge area, three televisions (Foxtel), laundry facilities and a private balcony or terrace. These spacious (121 square metres) and contemporary apartments are decked out in smart coastal décor and feature a master bedroom with king or twin beds, full-length mirror and ensuite shower bathroom while the additional bedroom features a king or twin beds and separate main bathroom with shower/bathtub. 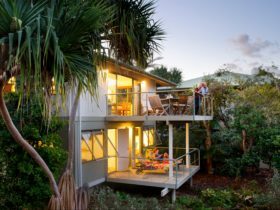 The separate open plan kitchen, living and dining areas are fully appointed with an adjoining private terrace or balcony with outdoor dining setting – a great place to enjoy a glass of wine, soak up the tropical resort surrounds and enjoy the balmy Noosa air. Apartments are serviced weekly. Existing bedding sleeps four (maximum occupancy five, additional charges apply). Room Only (Breakfast not included). Auto club members in Australia and overseas (including RACQ, NRMA, RACV, AAA) receive a discount of up to 25% off accommodation rates when they book through RACV.